Toria (18 now) is in North Carolina with my cousin Eddie and his wonderful family for the week, and visiting their home in Ohio as well. They’ve rented a house in Nag’s Head on the coast and she’s hanging with her beloved second cousins and they’re wonderfully fun household. She is taking a gap year this year, having officially graduated homeschool this spring. She’ll be spending this year focusing on travel, volunteer work and finalizing her thoughts on which passion to follow first in terms of college and career. She has already traveled to visit friends in Oregon this spring, then Ohio, and now North Carolina and Ohio. We’ll be going to see Tiffany in Nebraska for a while after we come back from getting her, and our family friend Val (whom I’ve known since high school and is like family to me and to the kids) is planning to take her to Europe sometime this year. She is also starting up her own little shop, selling whimsical glass jewelry. Once she has it established, I’ll post a link! She just celebrated her 11 month anniversary with her boyfriend, Tyler. He is such a great guy and we all really adore him. She’s made some new friends that she really enjoys, and has been having a lot of fun playing with fashion and hair choices. 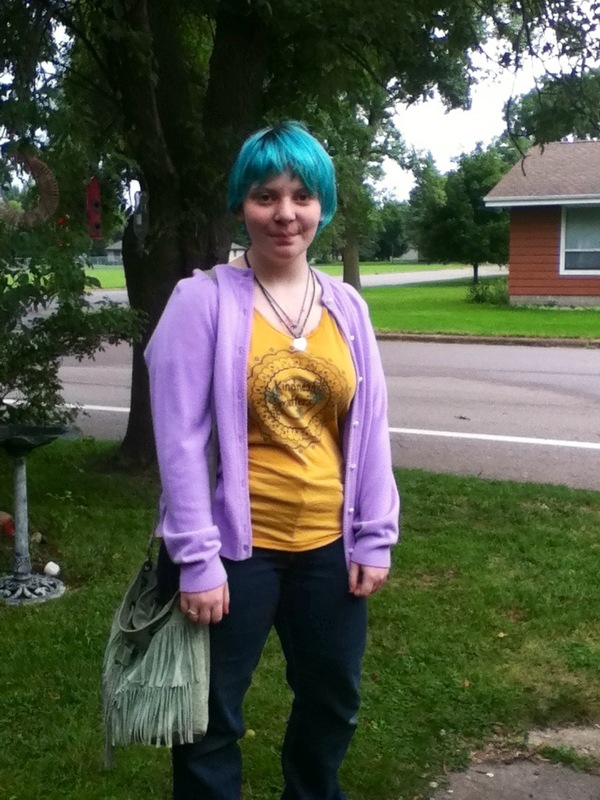 Her hair is currently green and yellow ombre with a partly shaved side. She is one of the only people I’ve ever known who can look good with something like that! She’s doing the hair and makeup for the Wilder Pageant, but otherwise just enjoying the summer off. She has been going to quite a few cool concerts with Ty, his sister and friends, and she’ll be going to the Warped Tour soon. Jack (13) is in the Wilder Pageant again this summer. I forget how many years he’s been in it now. Maybe six? He’s suddenly growing like a weed, and is now quite a bit taller than I am (though that’s not hard as I’m only 4’11”!). His voice is now deep enough that whenever I’m on the phone with Tiffany she says, “That can’t be Jack talking!”. 🙂 His blond hair has gone quite curly from the summer humidity and it’s so thick and full that I think it adds another few inches. He’s been getting into Manga books and fell in love with a series I brought home from a thrift store yesterday. He is also quite a fan of Nerf guns and we’ve amassed a massive cache of them from thrift stores since most of the other kids have caught the fever too. I’m not a fan of guns or the mayhem that ensues in their Nerf battles. One such battle accidentally landed Alex in the ER and required an eye patch for a week, so protective eye gear is now a rule in our house. But I also try to bite my tongue and let him do the things that bring him joy. He’s one of my biggest helpers around the house these days and I don’t know what I’d do without him. He helps a lot with laundry, Fiona, the pets and occasional cooking. He is the one I rely on the most for little odd jobs throughout the day — putting canned goods away in the basement pantry, hanging clothes on the line, grinding a batch of millet or brown rice flour in the Vitamix, setting up Fiona with something fun so I can fix dinner, and so on. Alex (9) has a temporary best friend next door. Our new neighbor has her nephew with her every summer, and he is Alex’s age and a fabulous fit for him. They play a lot of Minecraft together and we bring him with us when we do some fun things like head to the lake. We went to Sioux Falls yesterday for much-needed shopping, and we worked a visit to the zoo into it and brought the neighbor boy along. We have memberships to the zoo and children’s museum in Sioux Falls, and try to make time for something fun for the kids every time we head there for the boring necessities like groceries since I stock up on better deals at places like Costco and Aldi once or twice a month to help keep our food budget frugal. It was fun (and noisy) having an extra small Alex-like boy with us all day! Alex in the Wilder Pageant again, too. I think this is about his 3rd year, but I’m not sure. He has a lot of fun in it and does well. He is still a super active kid. He loves riding his bike and playing outside, and he’s got endless energy. He is slightly less exhausting as he ages, and he is constantly making me smile. He continues to be fascinating with anything scientific, and soaks up scientific information like a sponge. I was trying not to grin last week when he had a new friend in the back yard who was listening rather glassy-eyed as Alex explained in depth how to make a still. Fiona (4) is in the Wilder Pageant for her second year. She loves it, and looks adorable in her long braids and prairie dress. 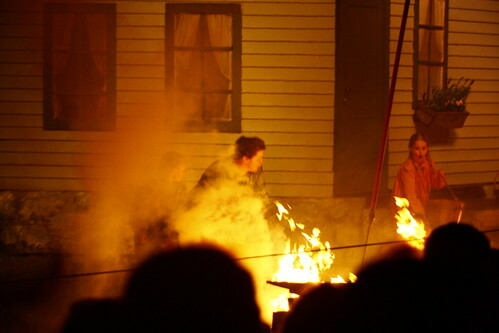 She is quite the actress already and she’s learned most of the lines for the other actors. She sometimes quotes them to me and then expects me to know how I’m supposed to answer. She particularly likes quoting the little girl in the grasshopper scene (“Mama, mama, I can’t sleep. I keep dreaming about grasshoppers. They’re in the house and in my hair and everywhere!”… Or something like that — she could tell you exactly!). Then I answer with a silly answer that’s not quite what the mama is supposed to say and she grins and corrects me with my proper line. She is learning to spell and read a few new words, and is impatient to learn to read. I’ve told her that she’ll learn soon. By child #5, I can tell how close she is to having it all click into place, and I have a lot of tools in my tool chest to help that happen soon for her. It’s a goal for me to do something fun in reading readiness every day this summer, and then step it up a bit in the fall if she wants. Of course, we read together every night and that’s probably the single best way to get children ready to read. She still loves doing art, too, and it’s a huge part of her day. I love her drawings and paintings. Toria has been a big influence for her there. That really helps her writing, too, since it gives her the fine motor control to make it easy. He’s also been doing quite a lot of foraging with the kids. He and the kids (mostly Toria) gathered over 60 pounds of wild asparagus this spring that’s in our freezer for the winter now. He’s also gathered black raspberries (several gallons), mulberries and now bush cherries. We transplanted a few black raspberry bushes from the wild a few years ago and they happily took over a section of our back yard, so it’s questionable if that counts as foraging or not. I’m glad we did, as the county mowed down all the raspberry plants and cut down the mulberry trees last summer. I wish there was less focus on making nature look tidy and empty. 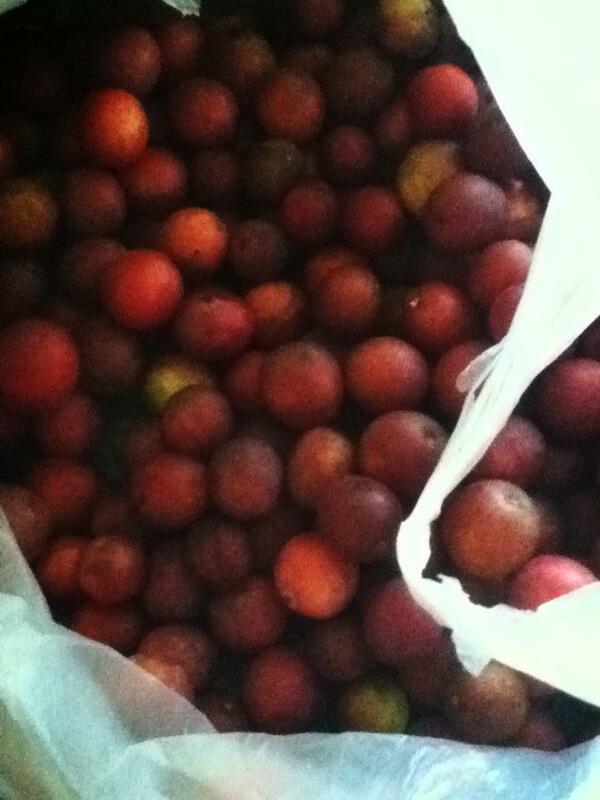 I know we were hardly the only family who gathered those delicious fruits every summer. I have been extremely busy, even compared to my normal level of mayhem. Examiner notified all of its writers on July 1st that it would be taking down the website around July 10th, and I had to move thousands of articles to a safe place to keep them. I am starting several new websites where I’m reposting those articles. It will be better for my readers, since they won’t have to put up with those annoying pop-up ads and sometimes-horrifying “trending stories” that adorned the sidelines. It’s not so good for us, though, as I’m out that paycheck! I’m putting Amazon affiliate links on the sites and asking people who wish to support us to click through for any shopping they wish to do, hoping that helps a bit in making up for that loss of income. I am choosing to look at it as a blessing, since it will give me that push off the proverbial cliff in to new directions and new beginnings, like it or not! Our house is currently brimming with kittens and cats, and I’m working to get that down to a calm roar. I rescued a beautiful feral female last winter and it turned out she was pregnant, so I had to find homes for her 4 kittens (3 down, one to go). Then another feral cat moved her kittens into our garage. The mama was very wild and the kittens were already becoming as wild as mama, and I knew that they could never be adopted if I couldn’t tame them soon. They were too young to be weaned though, so I tried a desperate experiment and caught one and brought him up to our feral (now tame) rescue mama inside. She sniffed him, licked him and proceeded to nurse him, and I caught the other babies and she adopted them immediately as her own. Now they are old enough to be weaned and move on to new homes. They have become friendly, social, loving and litter trained. My neighbor has agreed to take one (a black kitten she’s named Zeus) but there are three left to place. In the meantime, our old cats are doing a fairly good job of being overrun by all of these manic kittens! We managed to catch that feral mama, brought her in to the local vet to be spayed (courtesy of a wonderful county rescue organization) and released her again. She has adopted me as the only human she will let pet her, and she is slowly becoming trusting and very loving. In addition, we’re having a ton of much-needed renovations done to the house over the next month, and it will require pretty much emptying our entire downstairs and work done on all four floors (main, upstairs, basement and attic!). I am completely overwhelmed by all that has to be done, but it’s another thing that will ultimately be a huge blessing when it’s done. That’s just a fraction of what’s been going on here! I will try to start popping in more regularly so I don’t have to do massive updates like this every time. Hope your summer is going well! Lots of things started in our family last week. The foraging/gathering season really took off for elderberries, wild plums, pears, apples and acorns. Daryl’s parents have more apples than they can use, so he headed out there and gathered four bushels of apples to process. One bushel’s worth has already has been processed and two big pans of apple crisp are in the oven as I type. I also traded some apples and dried elderberries to a friend who had extra backyard plums. 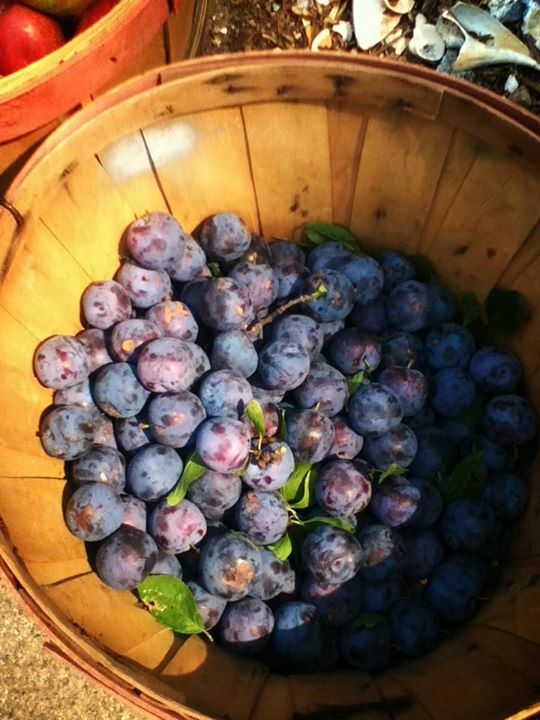 Aren’t they the most beautiful plums you’ve ever seen? Victoria also started her new job. She did training on Thursday and she’s been working every weekday since. It will go in spurts when her supervisor is in our part of the state, but he plans to do a lot of work around our area for a while. Her first paycheck should be awesome. It was a wonderful day and we had such a good time with wonderful friends. I love taking part in living history events, not just because of all the kids learn but also because it’s quite simply just fun. Lots more has been going on — bowling and billiards at a birthday party, a new box of books… lots of things that start with B, I guess. 😉 And more. I’m starting to do my fall planning and I hope to get a tentative schedule figured out. It will be very loose and organic, as always. I’m excited to get into some new topics with the kids, though, and see what the new season brings. Last night was media night, so the cast ran through some of the more picture-worthy scenes for the press and gave some interviews. 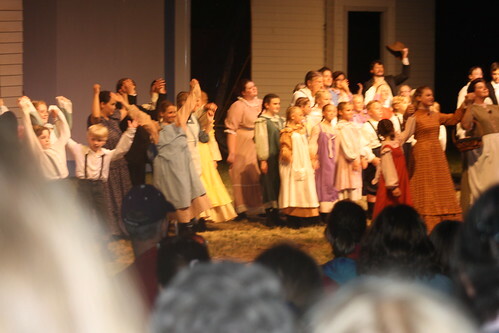 The editor of the local paper photographed my crew as one of the last remaining large families with lots of family members in the play. They’re supposed to head over to the paper this week to be interviewed. Daryl plays Reverend Alden and Elias Bedal (the mayor) again this year. He is great at both roles, even though they are very different. He is caring and inspirational as the reverend, and an odd combination of jovial and grumpy as the mayor. Toria is Mrs. Hansen this year, a Norwegian lady with a thick accent who is very proud of her “hus” (house). The Ingalls Family bought their sod house from the Hansens. 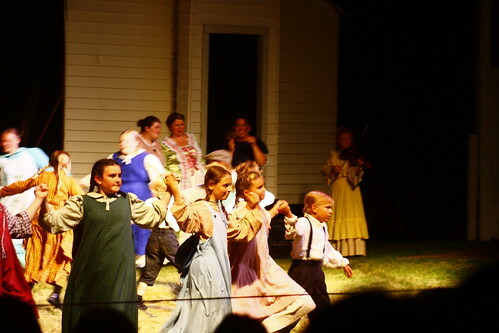 She is also an unnamed other woman later on in the play so that she can be in the dances and group scenes since Mrs. Hansen and her husband moved away when the Ingalls got to town. Jack, Alex and Fiona are all the mayor’s children. Fiona, at age 3, is doing wonderfully as Lucy Bedal. She had some adorable trouble with the stage bow/curtsy at the start of rehearsal and kept flashing the audience by just lifting her skirts up, but she now has a lovely little curtsy that she loves to show people. 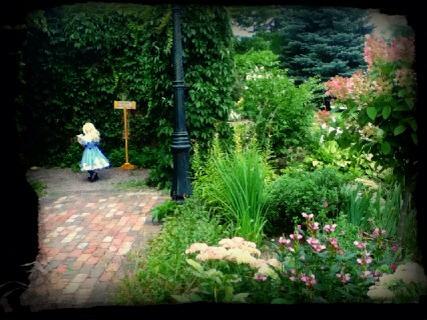 The show opens July 10 and runs for three weekends. 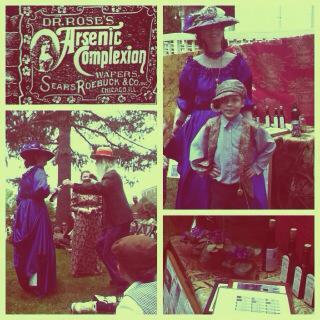 You can go to the Wilder Pageant’s Facebook page for more pics! July is flying past! We’re so busy, as usual. 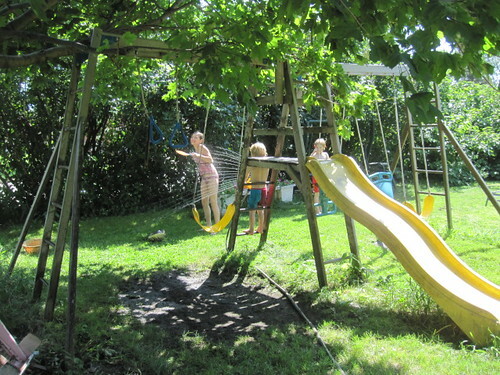 Here’s a bit of what homeschool looks like around here lately…. Daryl and the boys just finished the second weekend of the Wilder Pageant. 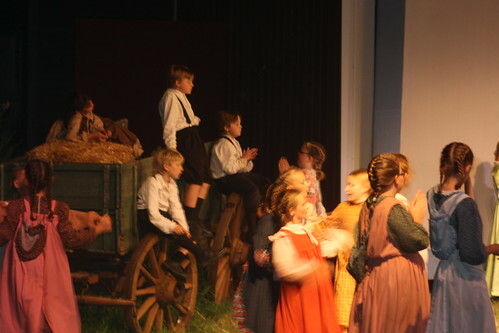 Attendance is averaging between 800 and 1,000 audience members a night. The performances have been really good and the weather has held out. Next week is a huge production with many of the cast members from the TV show attending. Ticket prices are higher, reserved seating has been sold out for months, and we’re anticipating crazy crowds. It should be fun! 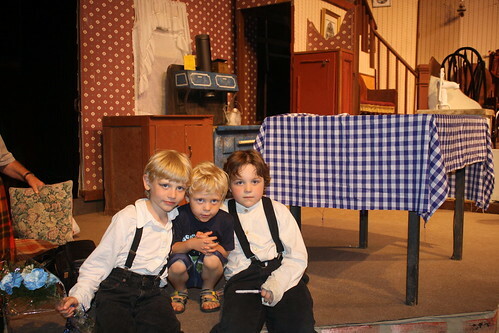 Jack took part in a 6-week day camp at a horse stable with other boys his age. They focused on crafts, woodworking, care of the horses and developing self confidence. Daryl paid off part of the tuition with volunteer hours, including teaching the boys how to play the spoons and teaching a group of 150 senior citizens about old time musical instruments. I printed out these Minecraft math worksheets for the boys. I thought they’d love them since they were Minecraft themed, but after an initial cheer, Jack got a closer look and asked what was Minecraft about them. I had to admit it was just a graphic on the bottom of each page and neither boy was very impressed. They did them anyway, but they weren’t pleased! I have to see if I can figure out how to really make Minecraft math worksheets. Maybe word problems? We’ve gone to the family festival in the park at Walnut Grove each Saturday. I love the family festival! 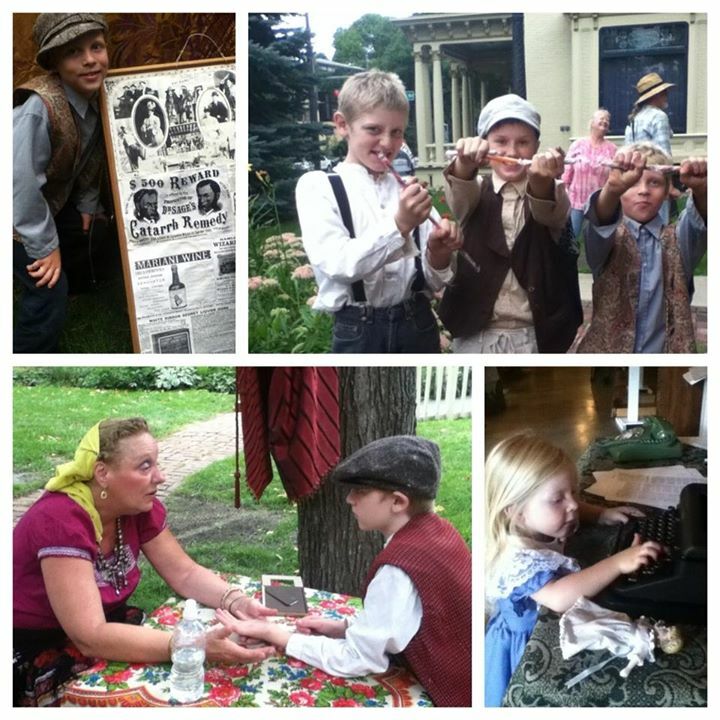 It’s free and full of fun crafts the kids can do, plus lots of demonstrations of old fashioned fun. There is also lots of great food to buy (go to the Hmong stand! the egg rolls and sesame balls are awesome! 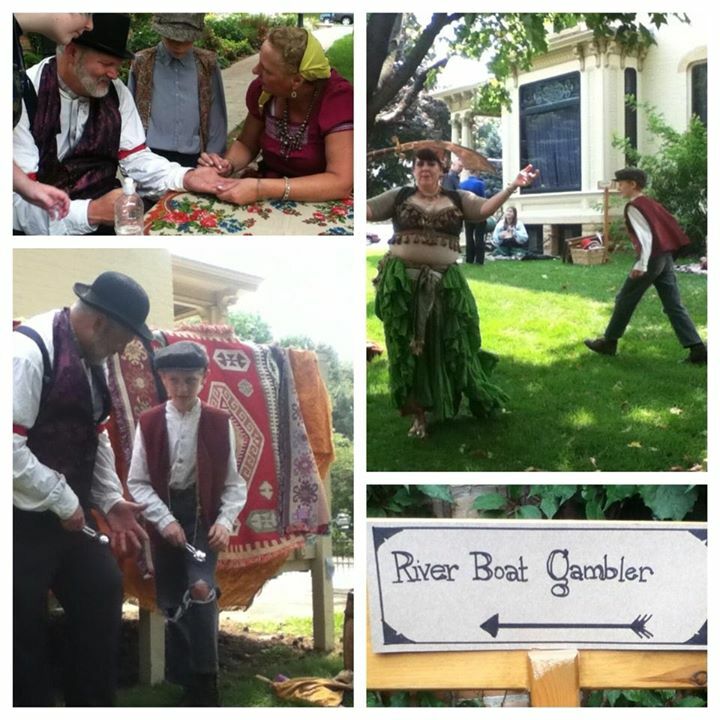 ), plus there are vendors who sell everything from handmade jewelry to old time bonnets to pottery. The three big kids continue to do Khan Academy for math. It’s just an ongoing assignment around here — “Do some math.” They do the subjects and amount of time they want and I get a report once a week telling me how much they’ve each done and what they’ve learned. I congratulate whichever kid did the most minutes for the week (it’s almost always Jack). Anna is writing a book. She’s been writing for a couple of months now and is quite serious about it. She’s on page 80-something and plans to self-publish it on Kindle. She has been a writer all of her life but I have never seen her stick to a project for this long. I’m looking forward to reading the finished book! The kids have been doing a lot of swimming at the city pool. We got a summer pass and Daryl has taken Victoria, Jack, Alex and Fiona just about every day for an hour or two. Anna prefers lakes. I’ve had lots of long conversations with Victoria and Anna. Recent talks with Anna have included the topics of the Gulf War, transgender issues, Iraq, Afghanistan, women’s rights before and after the Taliban, abortion, contraception, medical marijuana, photography, endangered animals, killdeers, toads, college, careers, Facebook, personality types, Edgar Allen Poe and lots more. Recent conversations with Victoria have included the topics of finances, relationships, Borderline Personality Disorder, #IamJada, naturally healing sinus infections and UTIs, single-celled organisms, LGBTQA issues and oodles more. We’ve been raising a baby praying mantis from birth! He/she is currently about 3 weeks old and about 3/4 of an inch long. Praying Mantis (PM) lives in an antique mason jar with a paper towel and rubber band lid, with an assortment of fruit on the bottom of the habitat. Every day or so, I tap the top enough to get PM to scoot off the top and then I remove the paper towel for a few minutes while we all watch carefully (we do not want a wild praying mantis living in our kitchen) and lure in some innocent fruit flies that are menacing my counter. PM is speedy fast at catching them! We’ll release our pet at some point into the garden, but it’s been a lot of fun to watch him/her grow. Life is also full of gardening, sleepovers, park days, sprinklers, sandboxes, picture books, chapter books, photography, poetry, video chats, art, play dough, hair experiments (Toria is currently bleach blonde and awaiting a new crazy color and Anna asked me to chop most of her hair off into a bob that looks adorable on her), bike rides, homemade contraptions, berry picking, LEGOs, Minecraft, beading, nature documentaries and the usual mayhem. 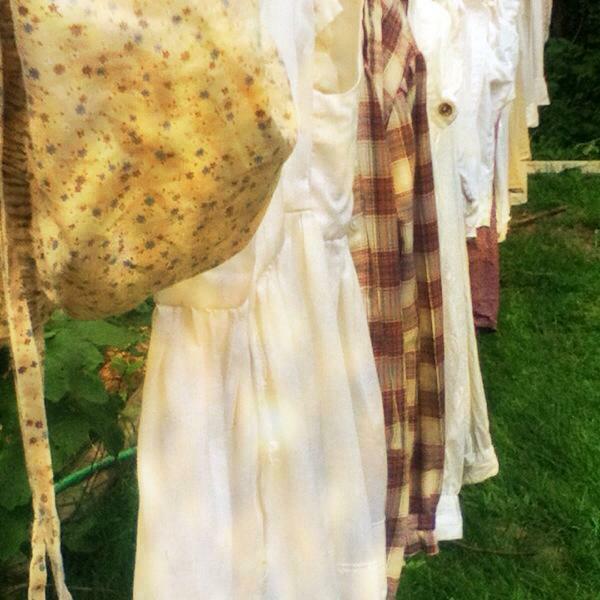 Opening night for the Wilder Pageant is in two days. The next three weeks will be crazy. Most of my family will be at the pageant every Thursday, Friday and Saturday night until after 1 a.m.
Every evening there will be the frantic search for clean costumes from the dryer, missing shoes, bonnets, etc. My kids will walk around during the day with smudged black “fishtails” around their eyes from stage makeup. 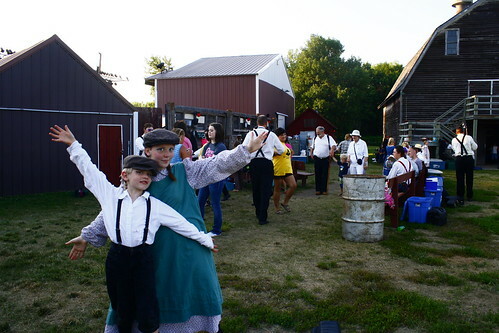 Thousands of people will be filling the hillside by the banks of Plum Creek in Walnut Grove to watch the show every weekend. 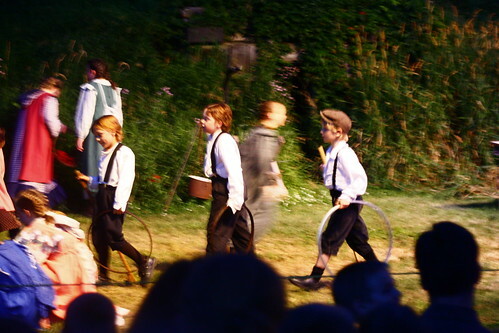 For two hours each performance night, the stage area will be transformed with real fires, horse drawn wagons, a grasshopper plague, singing, dancing and drama under the stars. My cast members will bring Sharpies every night to sign programs, t-shirts and the occasional car (!) after performances. My kiddos will fall asleep exhausted within minutes of getting home in the wee hours, and sleep late. Our lives will be transformed in the frantic, exciting, magical annual passage back to the past. This will be Anna’s 9th year in the pageant and Daryl’s 8th. 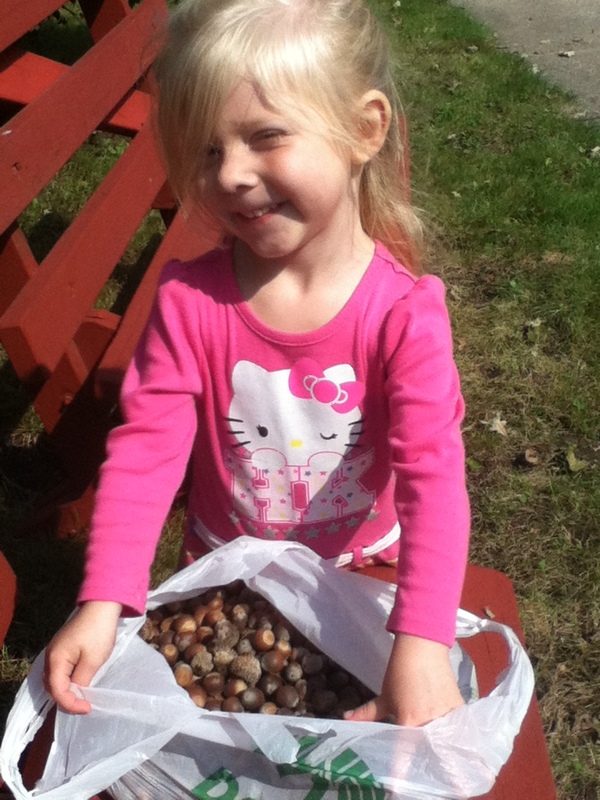 Victoria is sitting out this summer, after doing it every year starting when she was six. This is Jack’s 2nd or 3rd year and Alex’s very first. Click here or here or here or here or here or here or here or here or here or especially here if you want to see pictures or read accounts of some magical memories from earlier years in the pageant. Oh what a long time it’s been since I blogged! We had massive heat and I had massive contractions and several of us were sick, plus the pageant was going on…. In any case, I finally had a minute to post and thought I’d do a little update. 1. We went to the science museum in Sioux Falls. 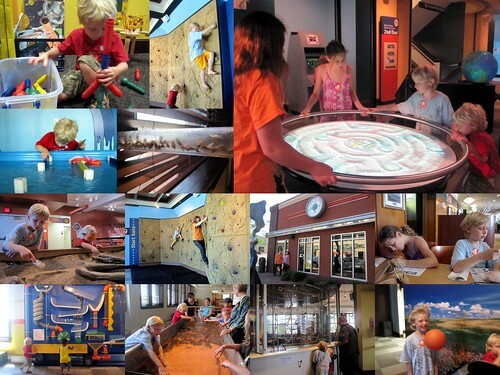 Annual memberships to science museums are so worth it, especially on hot summer days! 2. Anna is reading “Little Women” on my Kindle. 3. Victoria is learning Latin from a book she downloaded from this list of free Latin books online. She loves it. She’s doing the Latin for Beginners one. 4. 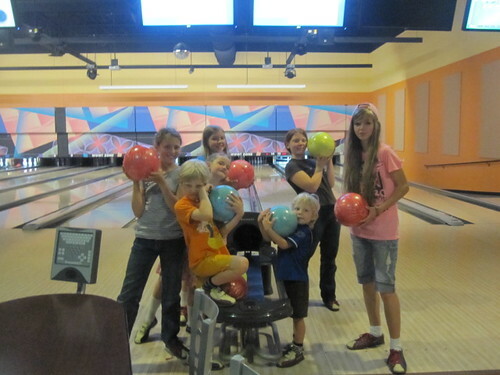 We went bowling with fabulously fun friends in Mankato. 5. The kids did math and such in various workbooks. 6. 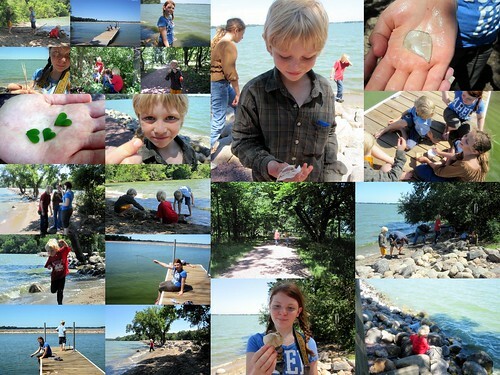 We went hiking on Loon Island with some wonderful homeschool friends. 7. 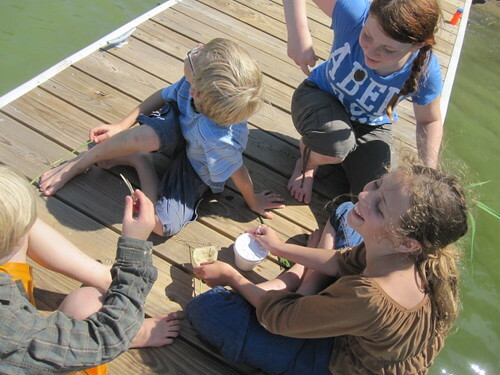 Daryl took the kids to various lakes and to campgrounds to visit friends. 8. We had sprinkler fun in the back yard. 9. 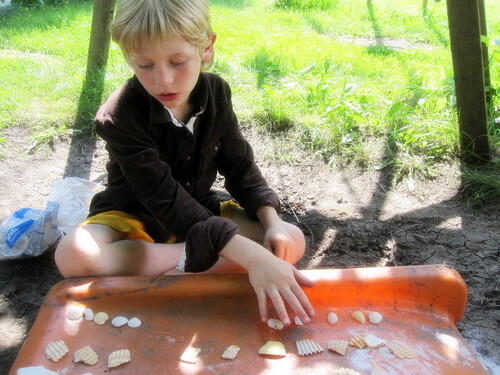 The boys and I made a nature abacus out of sea shells and did some math with it (more on that and some other fun summer HS ideas here). 10. 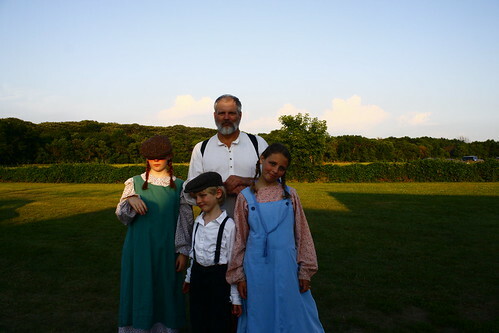 Daryl, Jack, Victoria and Anna finished this year at the Laura Ingalls Wilder Pageant. We figured out that the girls (who have been in the longest) have performed in 51 shows now for roughly 50,000 people! Jack loved his first year, too. It was a wonderful season. That’s a bit of what we’ve been up to. There’s also been lots of reading, art, educational apps, cooking, chores, tree climbing, playing with friends, photography and so on. Hopefully we’ll get a break from the heat soon and things will calm down a touch after tomorrow. I’d like a few days of catching up for a while!